‘Want to know how to use up that last bit of cranberry sauce? If you have a half cup of cranberry sauce and an 8 ounce block of cream cheese, you’re almost there. But first, I’ll tell you why this cheese ball is the best thing ever…It’s quick, easy, and absolutely delicious. It was the perfect snack this weekend while we I got our Christmas decorating done. Great with buttery crackers, and even better with Swedish ginger snaps…it goes well with hot beverages and is equally delightful with something light and bubbly. Spoon mixture onto plastic wrap and shape into a ball. After chilling for 30 minutes, roll in finely chopped pecans…Done! 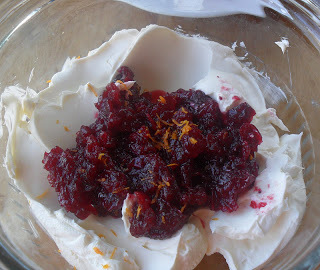 Place cream cheese, cranberry sauce, and orange zest in a bowl and stir until well blended. Remove from bowl and mound onto a 12″ piece of plastic wrap. 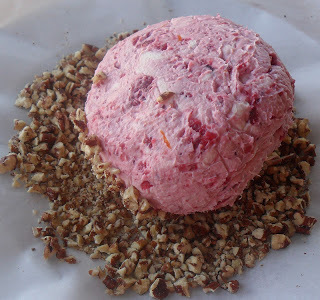 Pull up sides of plastic wrap, shaping cream cheese mixture into a ball, twisting plastic wrap at top to seal. Place twisted side down on a small plate an chill in the freezer for about 30 minutes. 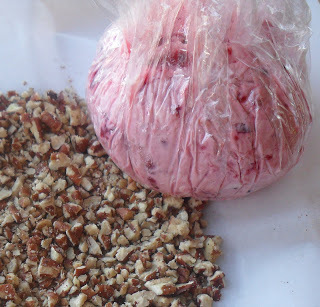 Remove plastic and roll in chopped nuts, completely covering the cheese ball. Cover and refrigerate until ready to serve. now that is a new twist on a cheese ball- at least for me it is. 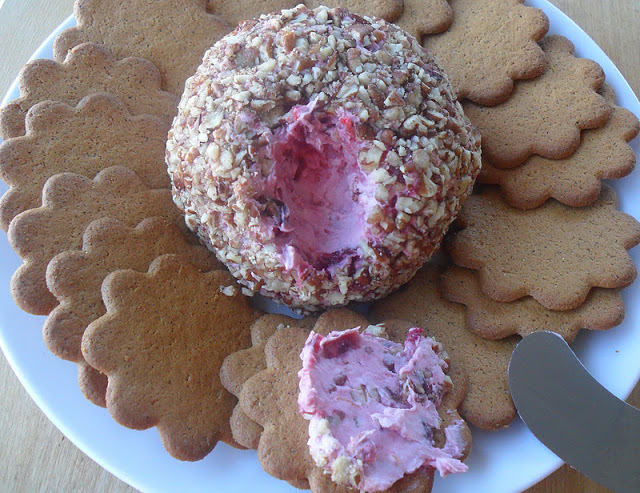 I love the idea of using cranberries in it. My husband’s mom is OBSESSED with all things cheese so this would be a wonderful surprise to make for her during Christmas! What a GREAT IDEA!! I was just mentioning to my sister what can we do with this cranberry sauce and you just NAILED it! Love it. Genius Shawn! I think I will make this for our next party.